The Toronto housing market remains strong, as the Toronto Real Estate Board recorded a 19 per cent increase in home sales in October compared to the same period last year. Prices were up more than 7 per cent, suggesting that the real estate market in the Greater Toronto Area is booming. 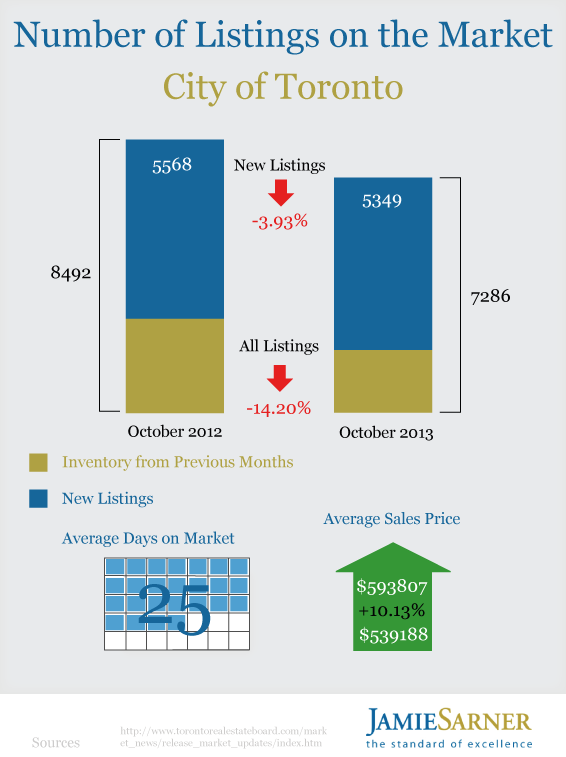 However, at the same time, the number of new listings on the TorontoMLS system went down. One theory is that we’re pulling forward housing sales by the reality that eventually interest rates will go up, so that some people who perhaps should be waiting a bit are going ahead and buying, but this is speculation and we’re going to have to look into it more. But I have no intention of interfering in the market at the time being. The supply of listings for many home types and price points has either been down year-over-year or at least not up by the same annual rate as sales. The additional Land Transfer Tax in the City of Toronto and the removal of the government guarantee on high ratio mortgages for home purchases over one million dollars have arguably led many homeowners not to list. 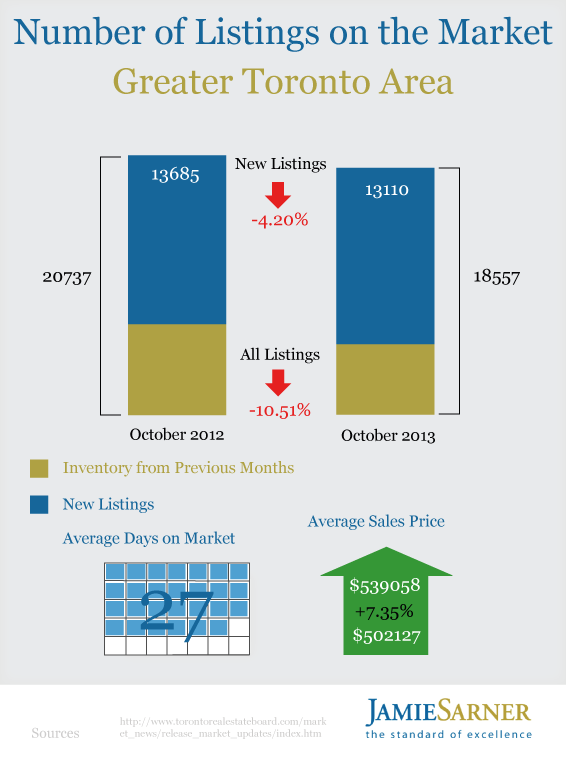 Also, the average selling price of a home in the GTA reached $539,058 in October. This represents more than a 7 per cent increase from the $502,127 recorded in October 2012. The MLS Home Price Index composite benchmark, which adjusts for changes in the types of houses that are selling, rose 4.5 per cent on a year-over-year basis. Growth in the average selling price and the MLS HPI Composite Benchmark will continue through 2014. Inventory levels for ground-oriented home types will be low from a historic perspective and home ownership demand will stay strong as affordability remains in check due to the continuation of accommodative borrowing costs. 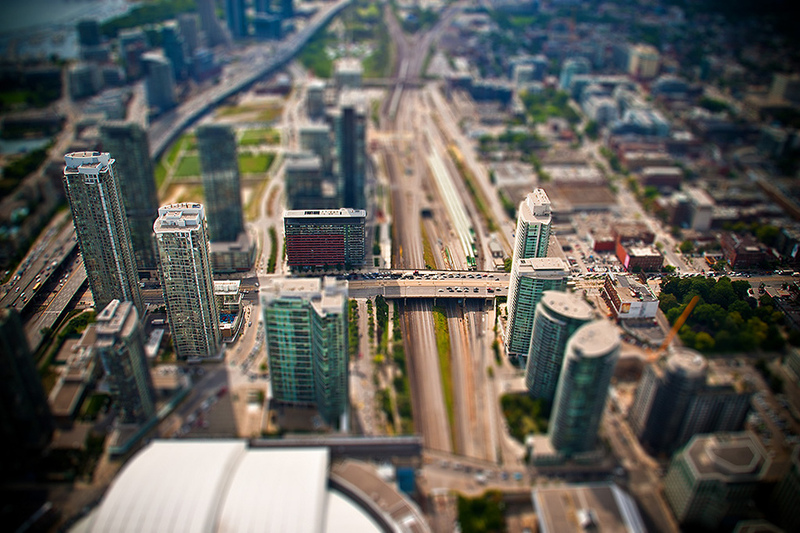 October 2013 was a surprisingly healthy month for the Toronto condo market, which was considered overheated and a significant risk to bursting the housing bubble. October condo sales were up 20.4 per cent in the 416 region and they surged up 35.6 per cent in the 905 regions year over year. 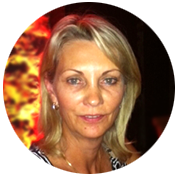 A report by Urbanation, a real estate consultancy, explained that sales of existing condos went up in the third quarter of 2013 by 23 per cent compared to the same period last year. However, the number of new condominium apartments sold recorded an 8 per cent decrease from last year, settling at 3,049 units. Even though this is the smallest annual decline recorded in more than a year, Toronto condo developers feel the pressure of excessive supply and are trying to attract buyers using discounts and other incentives. Buyers are cautious about the condo market and almost every building is either offering aggressive incentives, such as one-year free maintenance, or special credits and upgrades. According to Urbanation, there were only 11 new condo apartment projects, encompassing 2,557 apartments, that launched in the third quarter of this year. Developers are trying to stabilize the market by various means, such as reducing inventory, taking a more careful approach to new openings, and offering competitive prices. 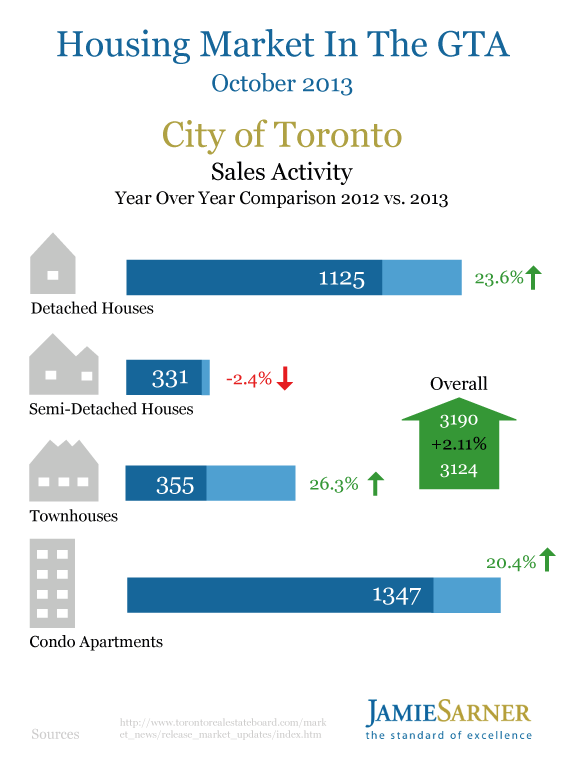 As a result, overall new condo sales for 2013 are forecast to come in at only 13,000 units. The numbers suggest the Toronto condo market is quite stable and there's no need to fear a bubble.